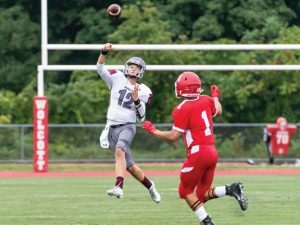 NAUGATUCK — After eight varsity starts, Naugatuck High junior and first-year starting quarterback Jay Mezzo is feeling rather good these days. 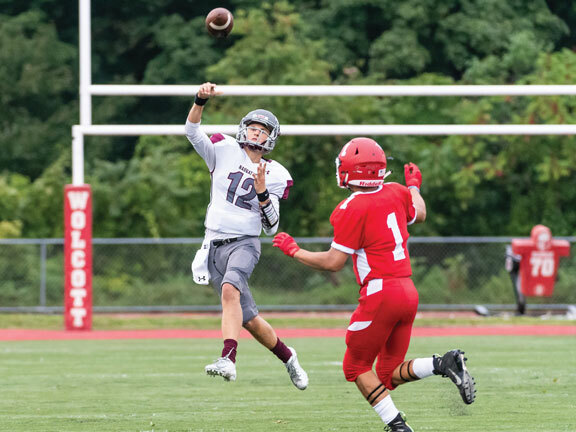 Especially after the Greyhounds’ biggest game of the season last Thursday when Mezzo rallied Naugatuck to a fourth-quarter comeback en route to a 28-26 Naugatuck Valley League victory over Seymour at DeBarber Field. Mezzo and the Greyhounds improved to 8-0 and are ranked first in the CIAC Class L playoff rankings. Against the Wildcats, Mezzo made two critical plays, the first in the final seconds of the first half when he connected with Zack Koslosky on a 9-yard TD, tying the score at 20-20 with just 4 seconds left. Koslosky’s PAT gave the Greyhounds a 21-20 edge at halftime. The second one came midway through the fourth quarter with the Greyhounds facing a 26-21 deficit. Mezzo tossed a 24-yard TD pass to Elijah Robinson on third-and-18 situation. The pass was perfectly placed in the right corner of the end zone with 6:44 left in the game. “There was a tight window and Jay made a great throw and Elijah made a tremendous catch,” Sollazzo said. Sollazzo said Mezzo has benefitted by the offensive line, featuring left tackle Syed Ahmad, left guard Ray Hess, center Anson Lau, right guard Andrew Balkcom and right tackle Derek McGrath, along with alternating tight ends Jonathan Vincent and Isaiah Williams. Before the go-ahead drive late in the game, Mezzo encouraged his teammates to rely on each other and to just execute like they were capable of. Vincent praised Mezzo for his even-keel approach, especially down the stretch. Mezzo said he is fortunate to have so many playmakers, notably Koslosky, Robinson, Williams and running backs Nick Airall and Malachi Gatison, around him. Mezzo credited his former teammate, three-year starting quarterback Mike Plasky, with helping him ease into the starting role. Plasky led the Greyhounds to a 9-2 overall record in 2017. He graduated in 2018. With two regular-season games left with Holy Cross and Ansonia, and the Class L playoffs less than a month away, Sollazzo likes the progress Mezzo has made.